Hi! I’m here again. Busy days, beach and sun. And diet or a sort of that. Was cooking in steamer – chicken, some veggies, have made pasta with mushrooms and cheesy sauce – nothing special. And the salad with fresh and thinly sliced cabbage, carrots and raw beetroot. Guess how do we call such salad in Russia? (answer will be in next post). And for a while greet the salad with figs and rucola leaves! So take a plate and washed arugula leaves. Sprinkle arugula with mix of olive oil, balsamic vinegar, 1-2 tsp dejon mustard. Cut figs, radishes and put them over arugula leaves. Add feta cheese, pine nuts and pancetta (it’s Italian bacon and I adore it! It isn’t necessary but of course more tasty). You can substitute it with bacon cutted into pieces. 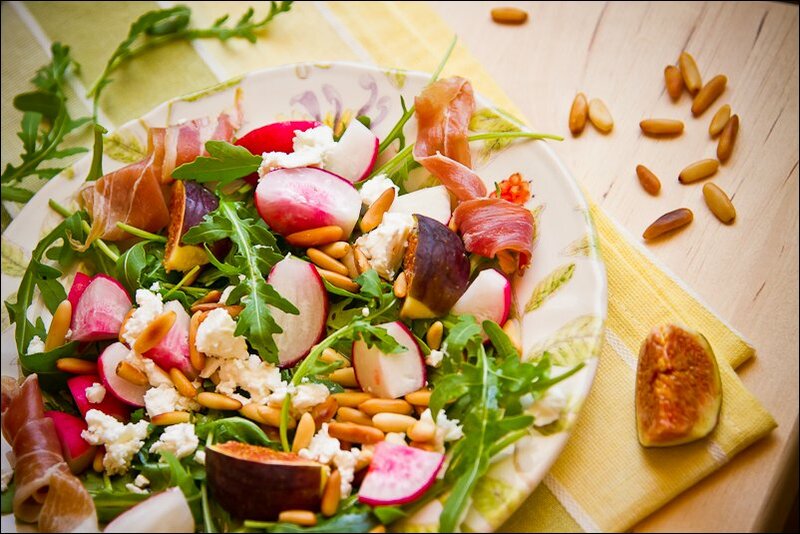 Nov12November 12, 2012 • By milkandbun • This entry was posted in Salads and tagged arugula, beetroot, cabbage, figs, food, food photo, fresh, green, healthy, My Life, nuts, pancetta, photo, pine nuts, radish, recipe, rucola, salad, veggies. Bookmark the permalink. Beautiful! A picture on a plate!